When I was a little girl, my dad used to go away randomly. He’d disappear in the middle of the night, or a family member would show up to pick me up from school. My mom would be awake, even if it was the middle of the night, and she always seemed upset about something. She’d tell me “daddy’s at work, he’ll be home soon”, but she didn’t seem any less worried. As a little kid, I didn’t get it. I just knew my mom was upset, and my dad wasn’t home, and I didn’t like it. In High-school, my dad was super athletic. He didn’t get great grades - although later when he went to college in his 40’s he graduated top of his class. His parents never emphasized college, and he was more interested in sports. He played anything: football, soccer, basketball, if it included a ball it worked, and he was good at it. So when he graduated high-school his options weren’t too varied. He knew he wanted to do something to help people, and something that involved team-work. He was good at working at a team, good at helping others, good at being part of something bigger than himself. So he went to the academy and joined a tiny police force on a decent sized island. He worked there for a number of years, before leaving to join the county police force, which was not so small. Dad talks about his early days as a cop as any young, active males dream - driving fast, catching bad guys, joking with friends, and of course, bench pressing 400lbs (no, really, he was ripped!). But, as time went on, he met a strong, independent lawyer - and despite her firm decision that she wouldn’t date a cop, he managed to convince her. A while later, they were married. And a few years after that, they had a daughter. By then, he’d moved up the ranks a little, and was in his 30’s. When the county he served decided to form their own SWAT team, they thought he’d be a good candidate. So he agreed. It meant dangerous jobs. It meant his wife sat up at 2am in the morning, praying. It meant attending funerals for policemen and policewomen killed in the line of duty. Next to his awards and letters of commendation, he has a stack of memorial pamphlets, and a book of all the police deaths in the line of duty up to 1995. But the SWAT team was good pay, and he got to do what he’d wanted - help. He also got to do lots of fun things, like learn how to repel out of helicopters, and drive an armored vehicle. A little while later, he was given the opportunity to serve as the commander of the SWAT team, and this brought its own stressors. I will never understand the responsibility of holding friends lives in your hands, based on your decisions, and I never want to. By the time dad retired from the SWAT team, I was in my early teens. We used to hold parties every year for everyone on the team. They were funny - I remember one old dude who got drunk and was stumbling around our porch, singing, until someone had to drive him home. They teased me, and pushed me on swing sets. They were silly, and weird. I’ll tell you something - that job changed my father. I look back at how he was when I was a little girl, and I remember smiles and laughs and playing catch in the yard. I love him now no less than I loved him then, but he has changed so much that at times I grieve for the father I had as a child. He almost never smiles. He has nightmares. He has scars. He wakes up yelling, and he stopped wanting to play catch with me a decade ago. He should be retired. He’s been hurt on duty, he’s had surgeries, but he refuses to retire until I graduate college. He and my mother have given me not only everything I needed, but everything I wanted. They worked hard to be able to support a horse, because horses are my passion, and I cannot thank them enough. They bought me Christmas presents, but they also bought presents for foster kids and families so they’d have something under the tree. Hell, one year they bought a tree when they found out the presents had no tree to go under. A few years ago, my dad started watching the news more and more. I don’t think it’s healthy, and neither does my mom - but he is a stubborn man. The entire family watched as more and more news stations reported on police shootings, particularly of racial minorities. We watched as friends and family started to believe that all cops are villains. I’ve watched my father grow tired and sad. He has served for over 35 years. He has served, and commanded, in situations more dangerous than many military are put in. He has done his best to provide for his family, protect the public, and make the world a better place. I’ve watched people curse at him in the street. I’ve been told by my mother not to reference his job in public, for fear that he’ll be hurt. I’ve seen my friends on facebook post things like “put down the pigs” and rant about how evil cops are. And I’ve been confused, and hurt, because all my father has done is give his best - and his country hates him for it. I have no doubt that there are corrupt police. I have no doubt that power corrupts many. I am also enraged by the police inflicted deaths of both minorities and caucasian individuals. But it breaks my heart to see an entire group vilified. I won’t say for the sake of the few, as I don’t know how many “good” cops and how many “bad” cops there are - I don’t even know how we’d quantify this. As I write this, I am watching the news on the Dallas shooting. So far, three policeman have been confirmed dead, and ten are injured. Try to understand that some of these officers have as much trauma as the military, who we valiantly defend. Many of the shootings are due to corrupt police, yes. Due to people who want power and will abuse it. And this should be fixed - I have no qualms with that. Whatever we can do to make the police-force, government, and business less corrupt, we should do it. But understand that often, police are terrified, too. They have training, yes, but when someone has a knife or a gun and is threatening you, fear is simply a fact. It doesn’t excuse unnecessary injury or death. But it can make it more understandable. 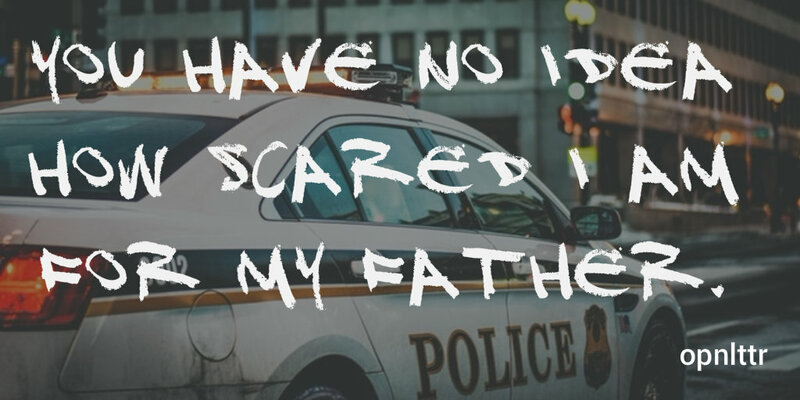 You have no idea how scared I am for my father. A few years ago, a man walked up and shot two police officers, sitting in their car, in the back of the head. I don’t know how many of you remember this - but I do, often. Every time I hear about a new attack or shooting of a cop. I am sickened and afraid of all the violence, both by and aimed at the police. I am scared to lose a man I love, and a man who is innocent. He is far from perfect - he is grumpy, and drinks way too much coffee. But he’s kind, and cooks delicious dinners. I don’t know how many of the policeman injured or killed tonight were arbitrarily good or bad, and honestly, I don’t care. They were human. I’ve been told I need to pick a side - I can’t support minority lives and policeman. I disagree. Supporting one movement doesn’t mean you can’t support another. I don’t see how one could think that the solution to police violence is to kill as many police officers as possible. I didn’t ask for my father to be a policeman - he was a policeman a decade and a half before I was born. I’ve written enough, but please try to remember - every police officer killed is just as human as the victims of police related crime. They have children, wives, favorite foods and unique smiles. And someone needs to stand up for them.